Ski Gunstock Lake Winnipesaukee area's finest Mountain ski resort in New Hampshire. It is close by to everywhere around the lakes region. There's lodging, dining, shopping and other leisure activities all within a short distance. 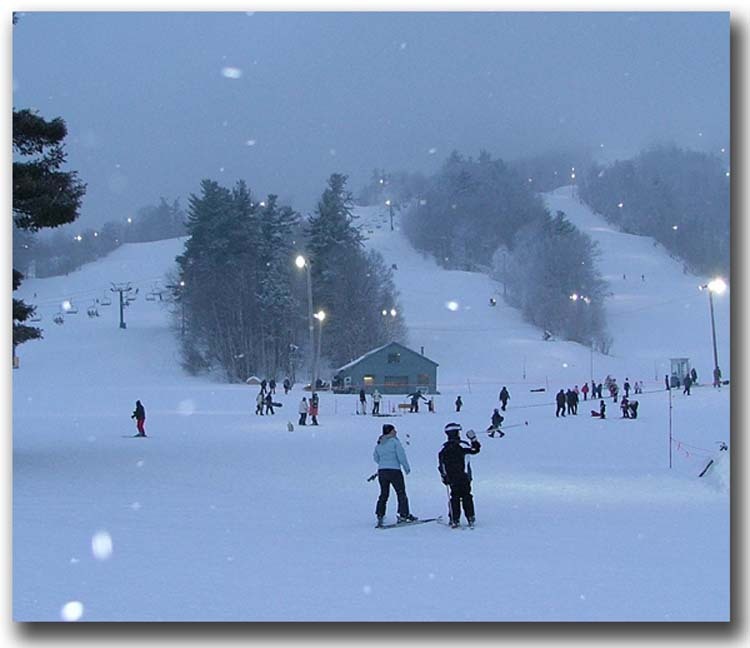 If you've never tried downhill skiing before, Gunstock in New Hampshire is a great place to learn. The smart thing is to get one of the rent/lesson packages. Gunstock will even guarantee to get you to a certain level of skiing with their "Mountain Magic" ski program that includes equipment and several lessons in a very reasonable package. In addition, to learning how to ski, there are many other ski programs available at Gunstock: Adaptive skiing, race, Gunstock Ski Club, Corporate race and more. So far, we've found that Gunstock has some of the best snowmaking in the state of New Hampshire. 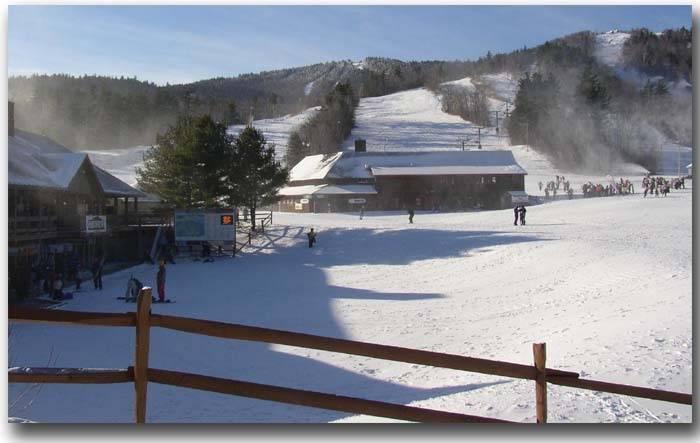 If there isn't snow in your backyard, you can find it on the slopes of Gunstock - in the winter, of course! We bring our whole family to ski Gunstock Lake Winnipesaukee area's terrific mountain resort in New Hampshire. It's fun to watch how the our children progress over the years. When the kids are really young, there's daycare available. Or you can do what we did. One of us skis and the other watches kids. When our oldest daughter learned how to ski, she went with Dad. I spent a lot of time with my youngest in the lodge coloring. Then, when she learned to ski, the action picked up. We got to go up and down the "Magic Carpet." The kids love it! If your kids are like mine, then you'll find that's where they want to be. After the "Magic Carpet", we progressed to "Gunsmoke." This is an easy slope for beginners. It would take about 45 minutes to get down. When it takes about 10 minutes normally. But the girls learned. Now, we can ski the whole mountain. My favorite trails are "Trigger" and "Red Hat." Dave likes the more challenging "Tiger" trail. We've noticed that both of our girls like to ski "in the woods." These little cut throughs on the side of the trail are fun and require some agility to get around the trees. They've become proficient with glade skiing now. It's been a few years since both girls started downhill skiing. Their confidence grew and now they ski off on their own quite a bit. We just hand them a walkie-talkie to contact us when the need arises. To update our progress, the girls have become very good skiers. They now go everywhere on the mountain and both of them ski faster than me. Both girls have taken additional lessons which have helped them refine their downhill skiing technique. Both of my girls are now on the school ski team. In addition, my older daughter has learned snowboarding. We bring both sets of equipment so that she can switch between skiing and snowboarding while we're there. 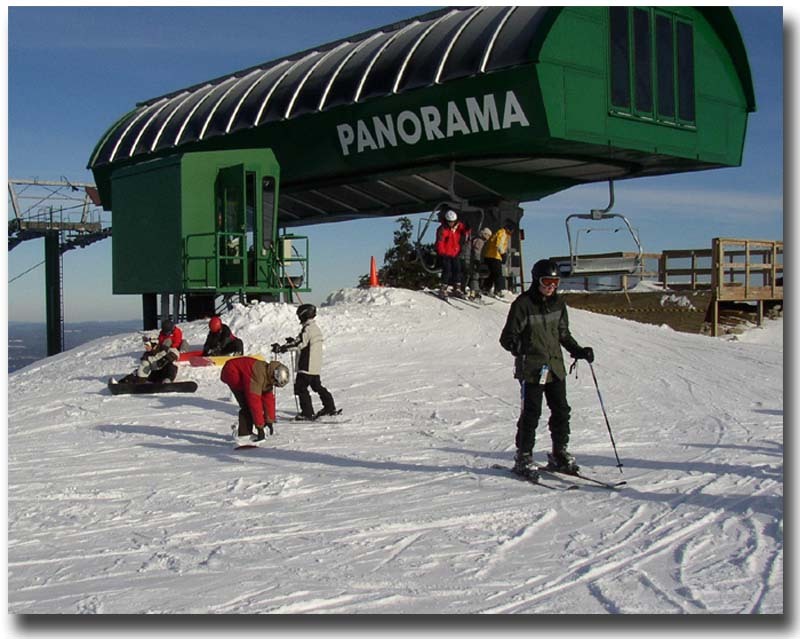 Ski Gunstock Lake Winnipesaukee area's best mountain ski resort when you're vacationing around the lakes region of New Hampshire in the winter. It's close by and offers many other activities other than downhill skiing. For variety, try cross-country skiing, tubing and sleigh rides. Return to New Hampshire Downhill Skiing from Ski Gunstock Lake Winnipesaukee.